According to our latest polls, 16.36% of our readers think the Santafish Monthly is a disgrace to the Santa hat. Are they right? Let's find out. The latest quest in the Myreque questline came this month with The Lord of Vampyrium. The Master-level quest features the Myreque infiltration of Castle Drakan and confrontation with Lord Drakan. It involves several battles and puzzles. A reward from the quest is the sunspear, which will automatically cremate vyrewatch corpses. The quest has received good reviews - read on for more information. An open Player versus Player version of RuneScape has been released, called DarkScape. In DarkScape, players can be attacked at any time, though there are some restrictions. Tough, level 138 guards patrol most towns and sometimes roads in between. There are three danger areas - low, medium and high, which determine what players can attack you and how many guards there are in an area. For example, in Lumbridge guards are present and you can attack someone within around 10 levels of you, but in the wilderness there are no guards and no level limitations when it comes to attacking. One extra perk of DarkScape is that it is completely free. Freeplayers can access all members areas. There are also no microtransactions. Members do have a slight experience boost, but freeplayers can play the game unabated. The game is also locked on legacy mode for everyone, so if you're not familiar with abilities you can still have a good time. In RuneScape 3, bonus XP weekend took place from September 25th to September 28th. In Old School RuneScape, an angler's outfit was added as a reward to Fishing Trawler, giving a major activity boost to RuneScape's second oldest minigame. Also, on October 1st the Abyssal Sire was added to the game. It acts as a boss version of the abyssal demon and drops the abyssal bludgeon and dagger. Both are powerful level 70 melee weapons. As a younger person, the Myreque were far from my favourite quest storyline. I preferred the likes of the Cave Goblin storyline, and the small but powerful Spirit of Summer questline. In Search / Aid of Myreque were kind of empty, and didn’t have much to them, Darkness of Hallowvale was excruciating, but I did like Legacy of Seergaze. Branches of Darkmeyer I did roughly five years later and it was a welcome return to the series, made easier by the fact I completed it after the EoC bombshell that broke every single quest boss in the game. Nothing in this quest line drew comparison to the greats, though, as none of these quests had quite the environments, characters, music, or significance like quests such as While Guthix Sleeps (WGS) (in my opinion, the greatest quest of all time) – until now. The Lord of Vampyrium (TLOV) is the greatest quest of 2015, by a longshot. I’m willing to argue it’s one of the best quests since the Evolution of Combat, and considering that we’re only two months away from the EoC turning 3 years old, (yep, let that sink in) that’s saying something. It’s better than the highly acclaimed The World Wakes (TWW), which I felt despite extraordinarily heavy lore significance was a formulaic quest with nothing really that groundbreaking or even interesting in terms of gameplay and mechanics. TLOV, I felt, was the closest we’ve had to a WGS follow-up in years. The best we got before this was 2011’s Ritual of the Mahjarrat (ROTM), which I thought was still a good quest, but it suffered slightly as the majority of the quest takes place in the final battle. WGS shone the brightest due to its very captivating way of using already existing locations for new things (The Khazard Battlefield, Juna’s cavern, Falador Castle / The Black Knight’s Fortress, the Chaos Temple and Taverly, just to name a few) yet still keeping the flow of the quest cohesive, making sure that it makes sense the way through, without this globe-trotting feeling overly forced as it was in One of a Kind. TLOV may be more centrally focused, but that’s the point of the Myreque series. The quest is mostly set in Lord Drakan’s mansion, but unlike quests like TWW, it still uses more than one area. When I first teleported to Burgh de Rott, I noticed they had updated the music, which I was initially disappointed about, but forgave as the old style wouldn’t have fit the new quest. I also felt the green fog pressed down more, and was more atmospheric. The first quest-specific area was the Icyene graveyard, which is a beautifully designed area. I felt like I had stepped into Fable 2 (and I only ever played that game once, five years ago, so forgive me if that’s just some wild memory I made up of it) with its creepy forest vibe, well-coloured atmosphere, and the perfect use of the skybox. We’ll get back to the skyboxes later on, because they’re important. Unfortunately the graveyard is only briefly visited, and you then return to some already known areas. After brief stints in the Sanguinesti hideout and the Blisterwood Tree Arboretum, the quest quickly makes its way to the roof of Castle Drakan. There’s nothing of that much interest up here, except for the skybox – Jagex have outdone themselves in this aspect. Up here, you can see out over the entirety of Darkmeyer, Meiyerditch, capturing the feeling of despair that ravages the people of Morytania too. Jagex also experiments with the player’s dark side here – you must make decisions for the Vyrelord nobles, some of which include telling them to do horrific things to their disturbingly terrified personal tithes. I felt hollowed out inside to look at them. Lord Drakan emerges; you do some quick thinking on your feet, but end up in the castle prison. The puzzles begin here, and I would like to say except for a few technical irritations, the puzzles were top-notch. What I look for in puzzles is that they are tough, but understandable – they’re designed well enough that you can figure out what to do and how to do it yourself instead of giving up to a guide like some puzzles I’ve had to do recently. (The Light Within, I’m looking at you.) The blood-taste puzzle was very interesting, and the last two ring puzzles were so satisfying to complete. In my opinion, a good quest unfolds like a good novel. TLOV does exactly that. Lots of recent quests haven’t; definitely not Plagues End, or The Light Within. (It’s a bit of a shame. The Elf series up to and including MEP2 is very, very well written.) TLOV progresses at a good pace, keeps things hidden beneath the main plot for them to shine through later at the end, tells the reader (player) the right things at the right time to create atmosphere and mood, kills characters at the right speed (the novel Mockingjay, for example, hurt due to the death of every main character in about 5 minutes of reading), and has a powerful ending. The way TLOV ends is astounding – Veliaf breaks, and the Myreque is no more. We’ve been following them for a decade, and they failed. The room for a Vampyre / Misthalin war is there, and Veliaf’s fate remains unknown. I feel Mod Tytn should be an author, because he penned a powerful story. That brings to me to my last point – Mod Tytn originally wrote the Myreque quest series when it began in 2005, and according to the Lord of Vampyrium uncut RuneScape livestream, has left the complete story behind when he left Jagex in 2010. I’ve noticed this over the years, and I feel TLOV proves it – the older quests are the best quests. 2006’s Recipe For Disaster, 2008’s While Guthix Sleeps, 2003’s Underground Pass (Yes, it might be annoying, but tell me Iban’s Cave isn’t awesome) & Monkey Madness, etc. are all great quests. In terms of writing (not gameplay, as some of these quests are still very primitive in terms of gameplay) the old quests are more involving, more creative, more interesting. Newer quests like The Light Within, Hero’s Welcome, and Dimension of Disaster have really seemed to lack the captivating feeling of powerful storylines. If it’s true the TLOV was written around 2005 or a few years on from then, judging by how good the quest was, this proves that older quests written by older Jmods, from a time when RuneScape was very, very different, were better. This just in: Martian 13A News has been informed of the discovery of running water on the surface of Earth. Some scientists speculate that this could open the possibility of life on the distant planet. However, the water discovered consists merely of dihydrogen monoxide and small percentages of salts and foreign materials, whereas our more diverse liquid hydrated perchlorate salts are much more apt to create life. Furthermore, the constantly changing ecosystems of Earth make it unlikely that any stable microorganism would be able to thrive. To spark carpal tunnel syndrome among our userbase, Sal's Realm set up a skill competition during the bonus XP weekend. After the 72 hours, Gocart came out on top with 46,711,256 experience. Gocart mainly used summoning, prayer, and fletching to gain his experience. Picalily came in second with 37,849,946 experience and Dei Wei came in third with 37,128,984 experience. Special mention to Sweetiemush, who gained 670% of his experience and also 245 levels. 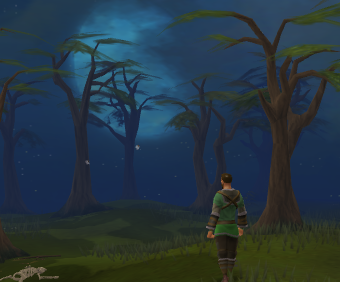 This month came a game mode that harkens back to the very first days of RuneScape. This mode, called DarkScape, allows players to attack players anywhere. It's already been explained a bit on this page, but to reiterate there are three zones: low danger, medium danger, and high danger. Low danger zones have guards patrolling towns and paths to other towns and severe restrictions on whom you can attack. Medium danger zones only have guards patrolling towns. High danger zones have no guard protection and no restrictions on whom you can attack. Each danger zone has its own bank and Grand Exchange. You cannot access one danger zone's bank from another danger zone. To transport items between danger zones, you must smuggle them over danger zone borders. Teleportation is also restricted. Lodestone teleports require you to have no items with you and other teleports require you to have no items with you if you're teleporting to a different danger zone. On the bright side, the game is free for all and experience is gained at a higher rate (1.5x for freeplay and 2x for members). Combat is locked on legacy. The game mode is mainly interested in flipping certain recognizable aspects of RuneScape, such as an AFK-easy environment, upside down and telling you "try it now." And it's fairly successful. Player versus player interaction is incredibly high, particularly in dangerous areas. Whenever you have to access Canifis for instance, you have to act inconspicuous and cross your fingers or else you'll find yourself on the wrong end of an obsidian maul. Good luck escaping without teleports. Understandably, this game is not for everyone. If you're one of the many players who gets mad every time you get PKed, don't play this game. It will cause more frustration than fun. If you're one of those players who enjoyed skilling in PvP worlds, you need to be playing this game. It's for people who find the main game monotonous and uneventful. Somebody crashing your spot? You can fix that. DarkScape of course has flaws, but most of these come from RuneScape. Although it had good intentions, EOC was one of the worst updates the game has ever seen, but not for the reason everyone says. The abilities are fine; if anything they disguise the actual issues that arose: weapon tiering, uniqueness of combat classes, pointless nerfing of food, increased power of weapons, yada yada. In a game that revolves around combat, these flaws in RuneScape 3's combat system are embarrassingly apparent. Fortunately for DarkScape players, there are planned ideas to fix these issues. Jagex moderators have recently posted a list of plans to combat which will generally fix the problems mentioned above. If the changes work well, hopefully they can implement them on RuneScape 3 as well. To summarize, DarkScape is a well-structured game mode for those who find the idea of open PvP RuneScape interesting. The only issues with it will hopefully be fixed quickly. And we can party like it's January 2001. So play DarkScape, complain about the Bill Clinton presidency, and pop open your N-Sync CDs.